This website is devoted to revealing the realities about Trap-Neuter-Release (Trap-Neuter-Return or TNR), also known as feral cat colony management. This is a process some folks and organizations have adopted in response to our ever-increasing feral cat population. In short, TNR does not reduce the feral cat population through natural attrition and comes at the expense of our native wildlife. TNR is inhumane for our companion animals and the existence of cat colonies contributes to the unending cycle of abandonment. TNR only appears to solve the problem of feral cat overpopulation, but in reality new problems are created. You may have never heard of TNR before now. You may not know what a feral cat is. You may not know the devastating impact free-roaming and feral cats have on wildlife. We hope you will by the time you finish browsing this website. You may be under the impression that TNR helps feral cats and protects wildlife. You may think that cat colonies pose no risk to human and animal health. You may feel that since some well-known organizations endorse TNR that means TNR is a humane and effective solution. None of this is true and we have developed this website to explain why - once and for all. Many TNR advocates present incorrect and misleading information to the public and we intend to rectify that by providing a wealth of detailed information and science-based resources. We simply ask that you do your homework so when a feral kitten or cat crosses your path, you will make an informed choice that does not result in putting the cat, wildlife, or humans at greater risk. We encourage you to explore our website and to examine fully all aspects of the free-roaming and feral cat issue. Some municipalities have legalized feral cat colony management, even in ecologically sensitive areas. The ramifications of this are serious. Learn about the consequences of TNR and discover how you can help. We should only make informed decisions and demand that our governments do the same. "Reality isn't the way you wish things to be, nor the way they appear to be, but the way they actually are." 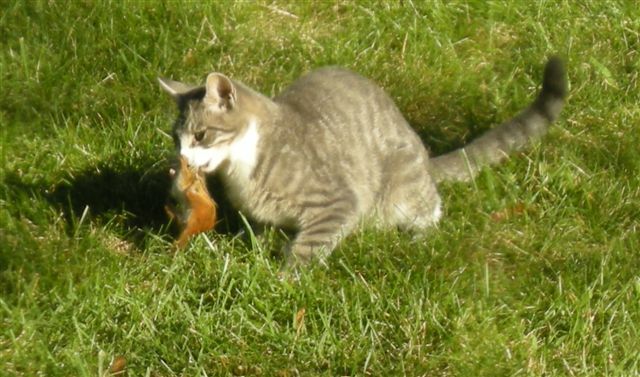 Chipmunk caught by cat. Photo provided by ACO.